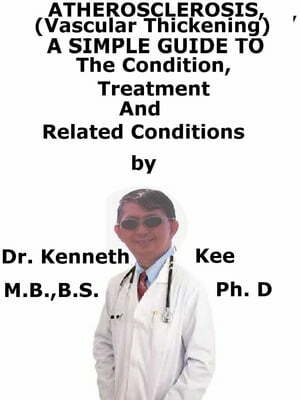 Collins Booksellers - Atherosclerosis, (Vascular Thickening) A Simple Guide To The Condition, Treatment And Related Conditions by Kenneth Kee, 9781370284849. Buy this book online. Atherosclerosis is a degenerative disease due to the thickening of arterial wall. Atherosclerosis is a disease in which plaque builds up inside the arteries. Arteries are blood vessels that carry oxygen-rich blood to the heart and other parts of the body. Plaque is made up of fat, cholesterol, calcium and other substances found in the blood. Over time plaque hardens and narrows the arteries. This limits the flow of oxygen-rich blood to the organs and other parts of the body. Atherosclerosis can lead to serious problems including heart attack, stroke or even death. Plaque may begin to build up where the arteries are damaged. Eventually an area of plaque can rupture (break open). When this happens, blood cell fragments called platelets stick to the site of the injury. They may clump together to form blood clots. Clots narrow the arteries even more limiting the flow of oxygen-rich blood to the body. Depending on which arteries are affected, blood clots can worsen angina (chest pain) or cause a heart attack or stroke. Treatments for atherosclerosis may include lifestyle changes, medicines, and medical procedures or surgery.